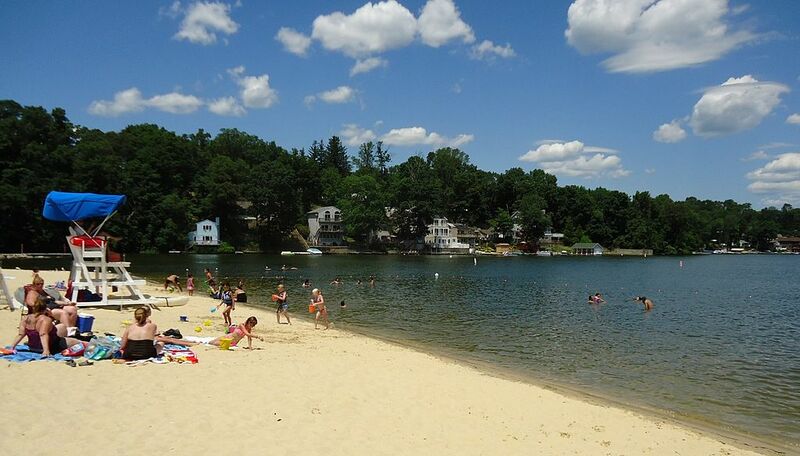 Visitors to Lake Hopatcong State Park are there to enjoy the bathing beach, children's playground, picnic areas or use the boat launch. Most are unaware of the rich history of the area and that 150 years ago, within a one mile circle of the park, a very busy Morris Canal was the location for boats heavy with cargo being pulled along by teams of mules along the canal banks, unaware of the nearby rail lines with large steam locomotives belching thick black smoke as they pulled trains carrying supplies to Union Troops fighting the last days of the Civil War, and a dynamite factory across the lake where accidental explosions often took lives. Yes, all within a mile of today's nice beach! 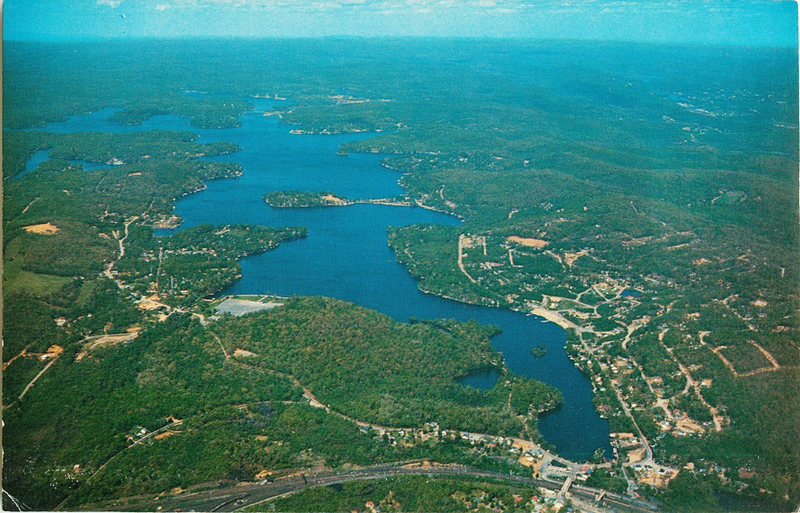 The story of Lake Hopatcong began in the 1750's with a natural lake called Great Pond, less than half the size of the Lake today. Around 1750 an Iron Forge was built near the southern end of the Lake at the point where it flows into the Musconetcong River. 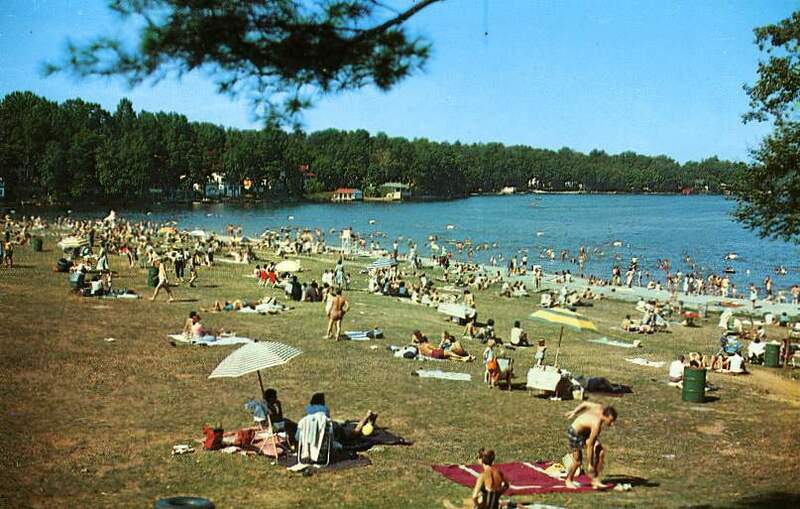 Called the Brookland Forge, it was located on what is now the Hopatcong State Park and operated for at least 30 years. A dam built for the forge raised the Lake level by 6 feet, submerging areas of shoreline. 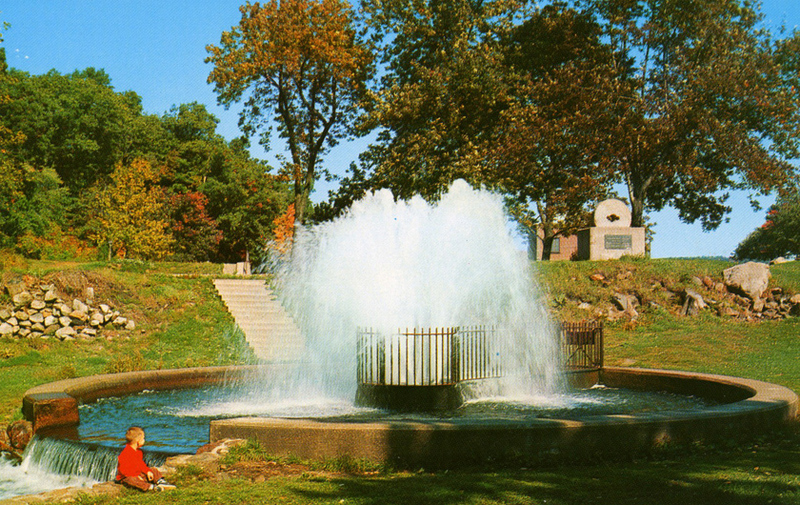 The Lake became known as Brookland Pond. 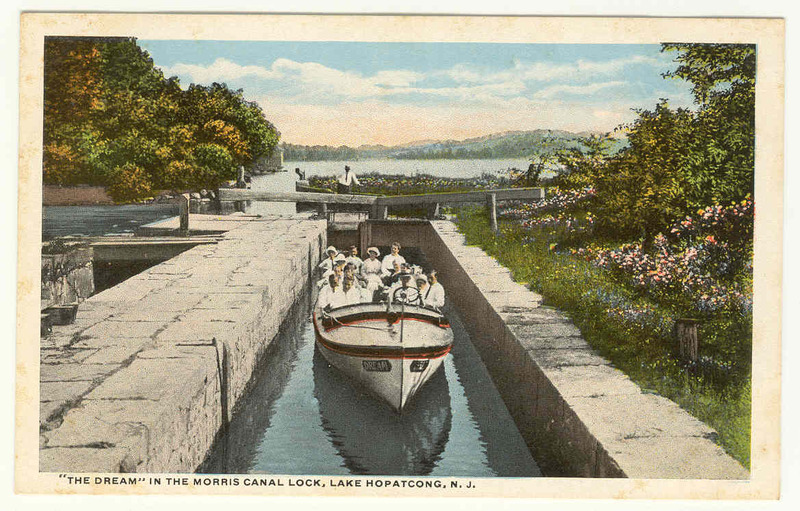 The need to move raw materials quickly across the state, from the Hudson River to the Delaware River birthed the idea of the Morris Canal. The canal would be an inexpensive way of moving large quantities of coal, timber, iron ore and other goods across New Jersey. It was the first American canal to climb hills using inclined planes where boats were floated unto cradles, then pulled on rails uphill, all powered by water pressure. The Morris Canal would run for 103 miles joining the Delaware River at Phillipsburg with the Hudson River, a mule-drawn barge trip that took about 5 days. In 1827 the canal company built a new dam on the Lake to use the large body of water as a canal reservoir. A lock is built that raised boats to the level of the Lake. Boats entered the Lake through a feeder of the Morris Canal. In this park, to the left of the beach, is a huge iron waterwheel on display, from Plane No. 3, which operated chains, later wire cables, pulling up the boats. There were 23 separate inclined planes along the Morris Canal. The first full boating season was 1832. The Lake becomes known as Lake Hopatcong. 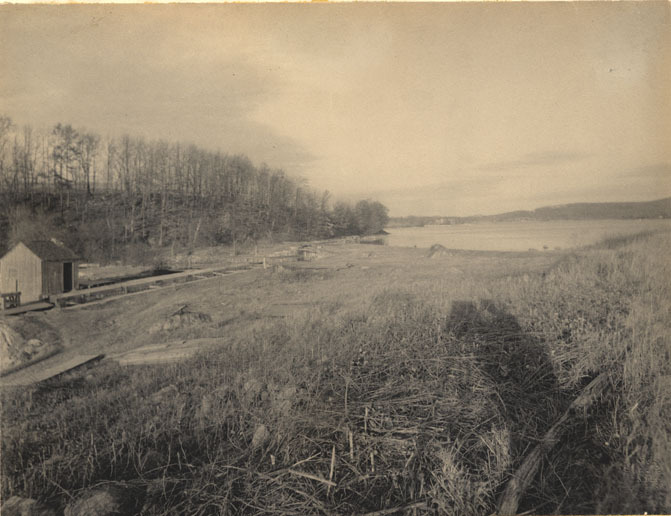 photo above, with the lake and current area of the beach to the right. Pleasure excursion boat "The Dream" in the lock, circa 1920. See image below for animation of "Then & Now"
Animated image of "Then & Now"
By the 1880's the canal was losing business to the faster railroads, and by 1903 with little commercial traffic, calls were heard to shut it down. Recreational boaters pressed to keep it open. Finally, in 1924 the Morris Canal was shut down, and the new configuration as seen today was built in 1925, with the current dam and stone sidings in what became the State Park. About 1958. Boat rides were offered at the Park, the vessel at right looks like an old Steam Launch that was refitted. About 1960. 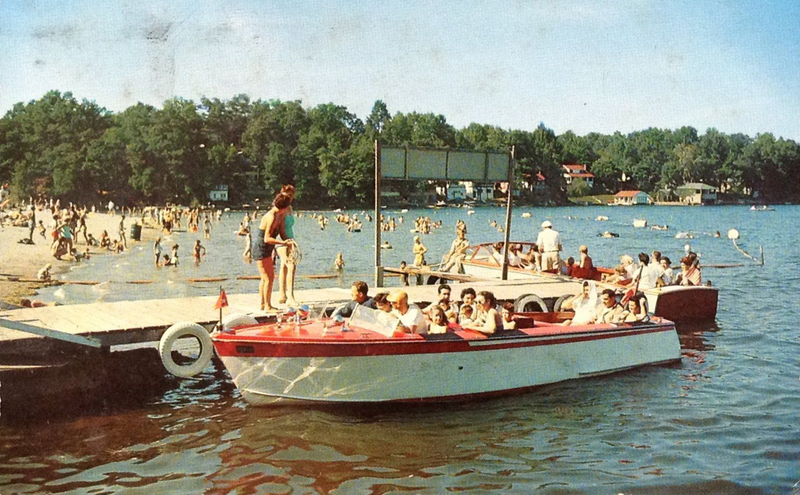 Boat rides were offered at the Park. Take exit 28 from Route I-80, follow signs for "Lake Hopatcong". One mile after exit, the Lake comes into view along with a traffic light. Turn left at light, go straight thru traffic light at shopping center, State Park entrance is a quarter mile up on right. Be advised that on summer weekends the park fills up early in the day. Some of these scans were made by the Editor. Please do not use without permission.